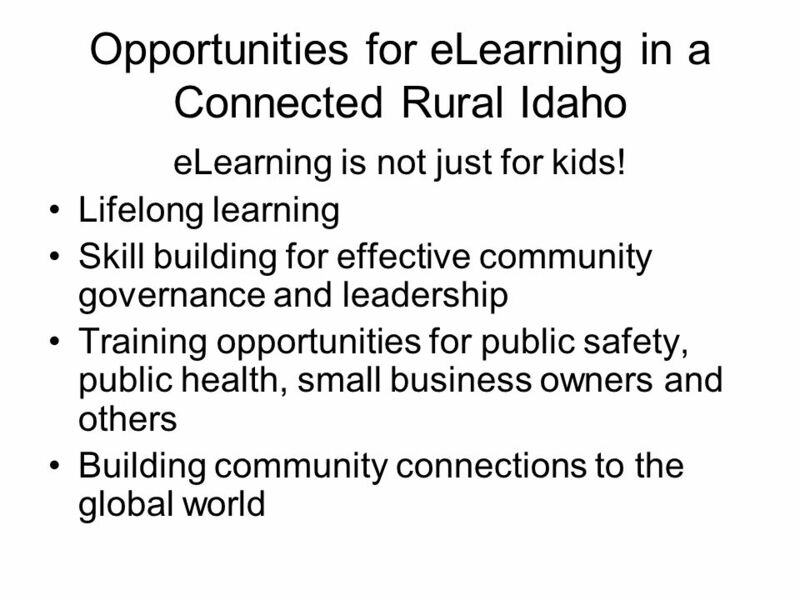 ELearning Applying Information Technology to Enhance Learning in Schools and Communities Presentation by Matthew Mitchell WSU Center to Bridge the Digital. 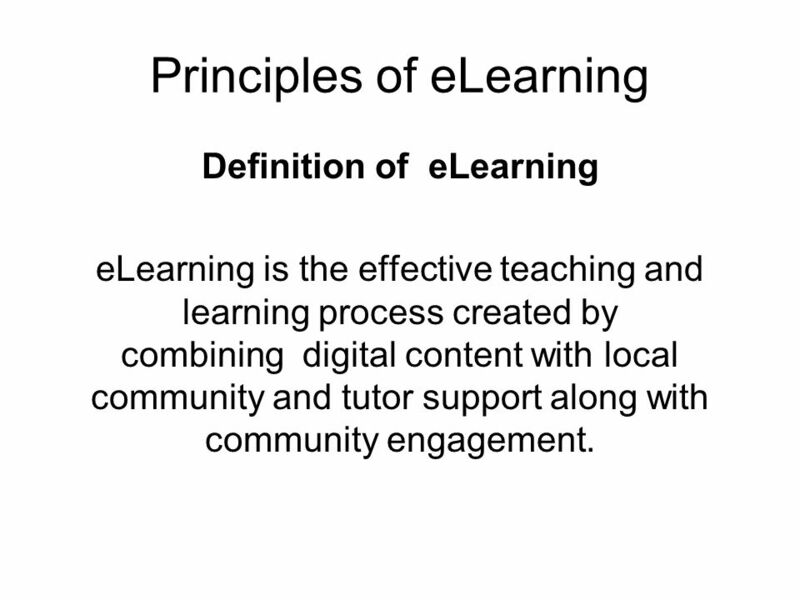 3 Principles of eLearning Definition of eLearning eLearning is the effective teaching and learning process created by combining digital content with local community and tutor support along with community engagement. 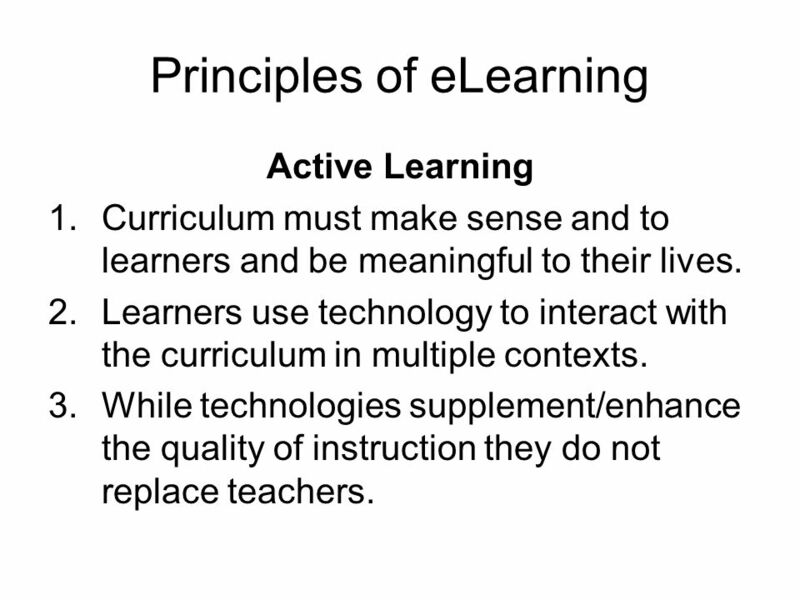 7 Principles of eLearning Active Learning 1.Curriculum must make sense and to learners and be meaningful to their lives. 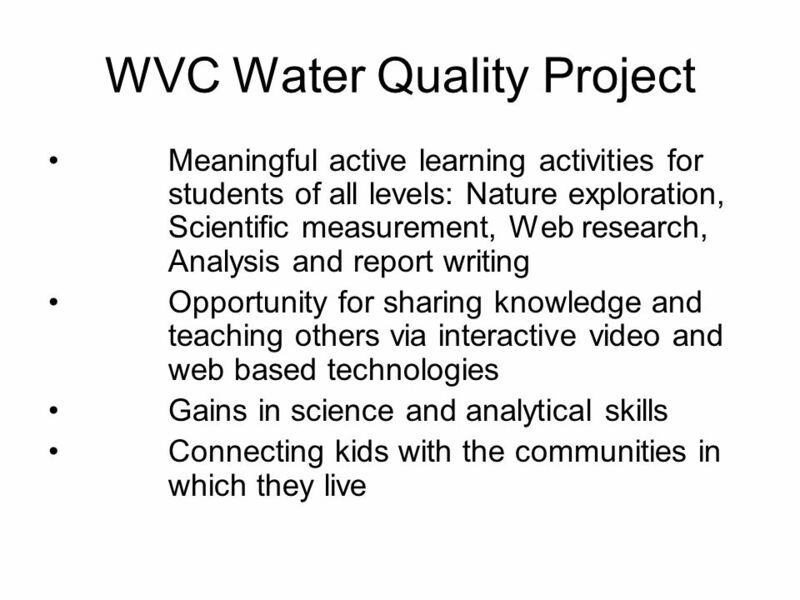 2.Learners use technology to interact with the curriculum in multiple contexts. 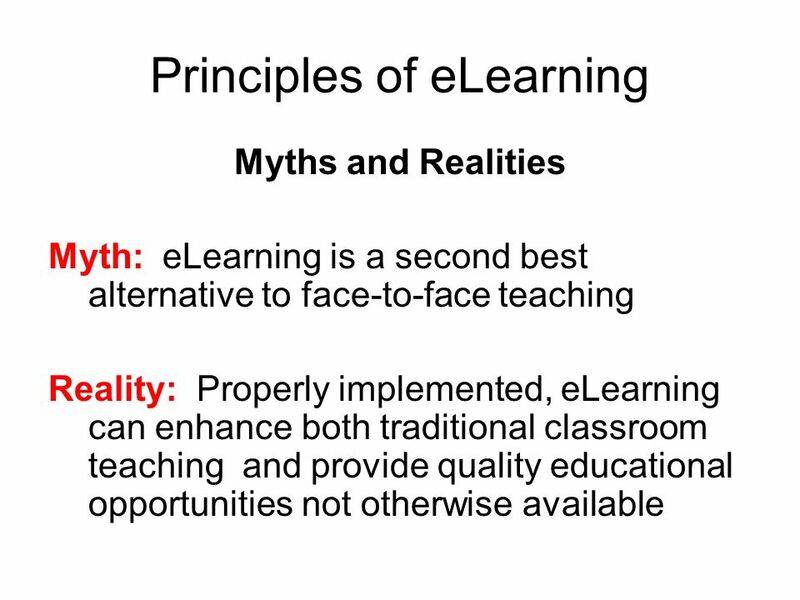 3.While technologies supplement/enhance the quality of instruction they do not replace teachers. 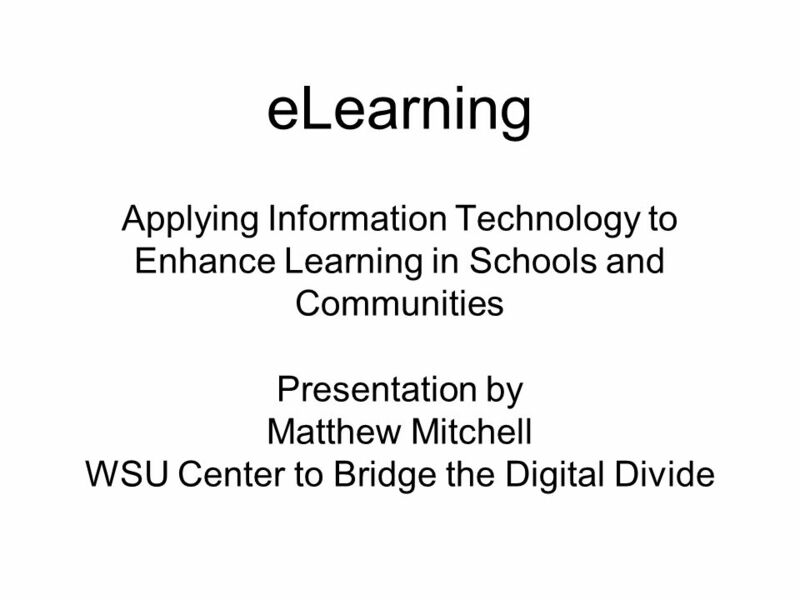 Download ppt "ELearning Applying Information Technology to Enhance Learning in Schools and Communities Presentation by Matthew Mitchell WSU Center to Bridge the Digital." 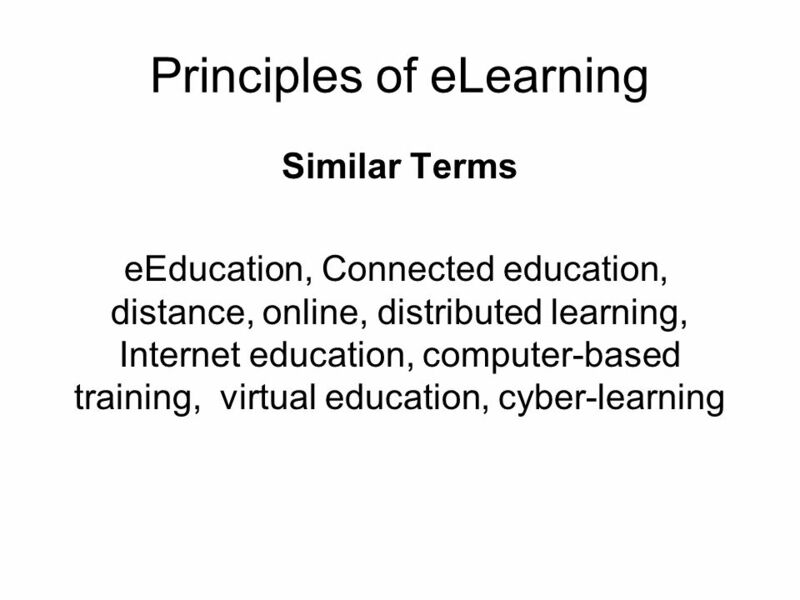 ICT in Education The Commonwealth of Learning (CoL) Certificate for Teacher ICT Integration (known as the CCTI) is a distance learning course which was. 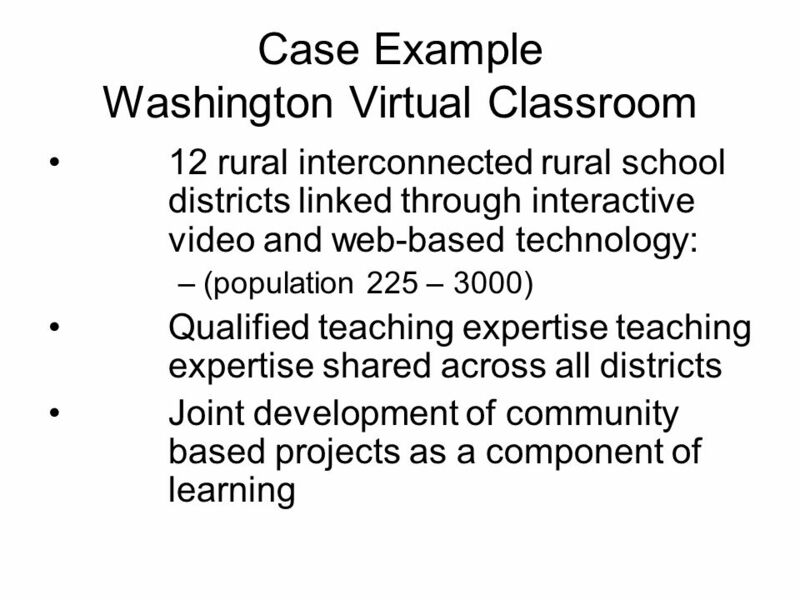 LL TCH 490 Blended Learning in the 21 st Classroom Dr. Han Liu Department of Teacher Education Shippensburg University Blended Learning. 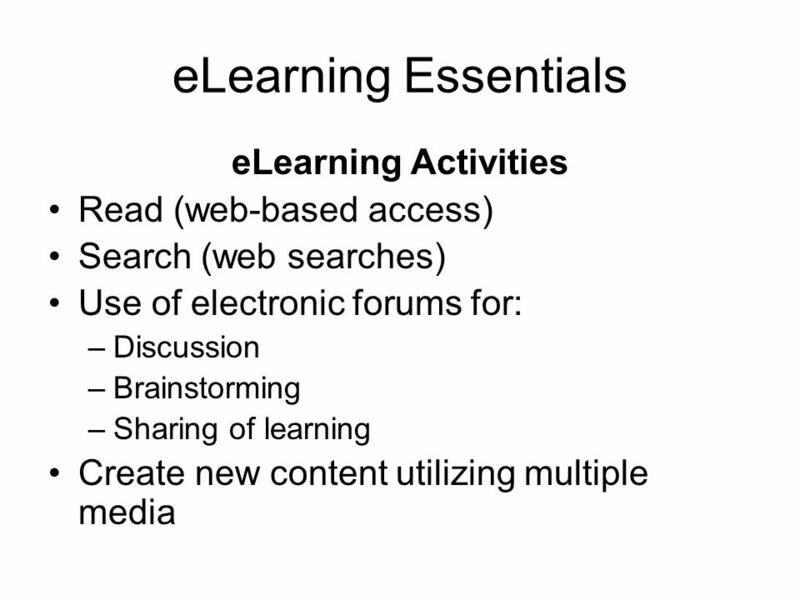 BEST PRACTICES TO SUPPORT ONLINE LEARNING FOR STUDENTS AND EDUCATORS Online Learning. 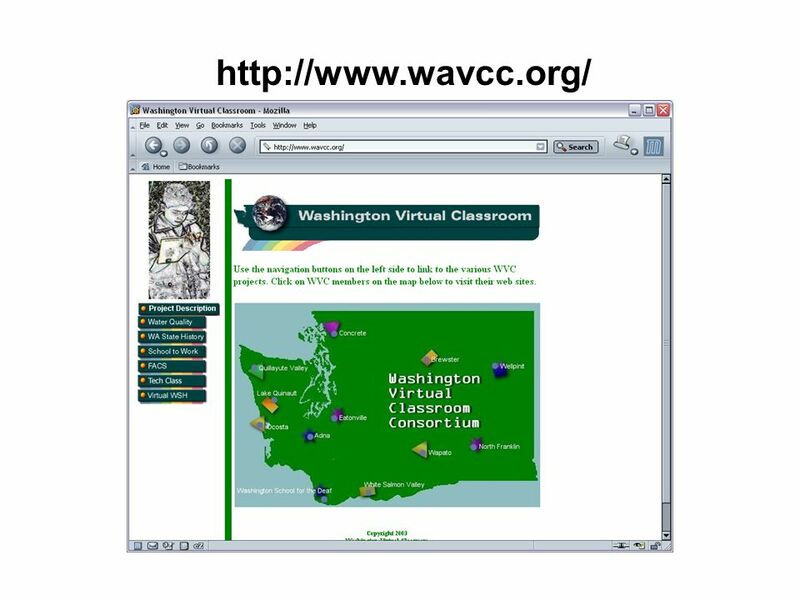 Web-Based Courses Web-Based Courses: An Overview BYTE Conference February 26, 2010 Howard Griffith Donald Girouard. 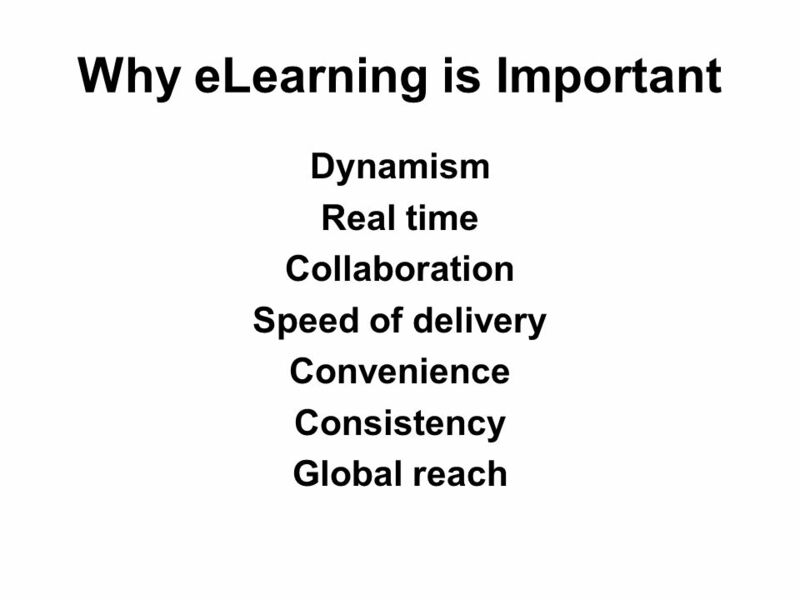 Week 7 Managing eLearning. 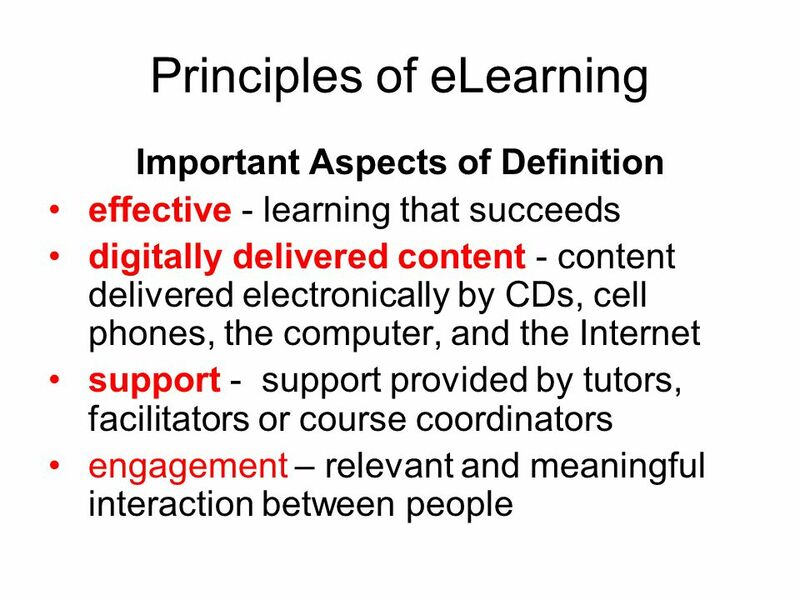 “...an approach to teaching and learning that is used within a classroom or educational institution... It is designed to. Presented by: Jonas D. Libiran. Introduction With the introduction of Information and Communication Technology (ICT) infrastructure to most of the rural. 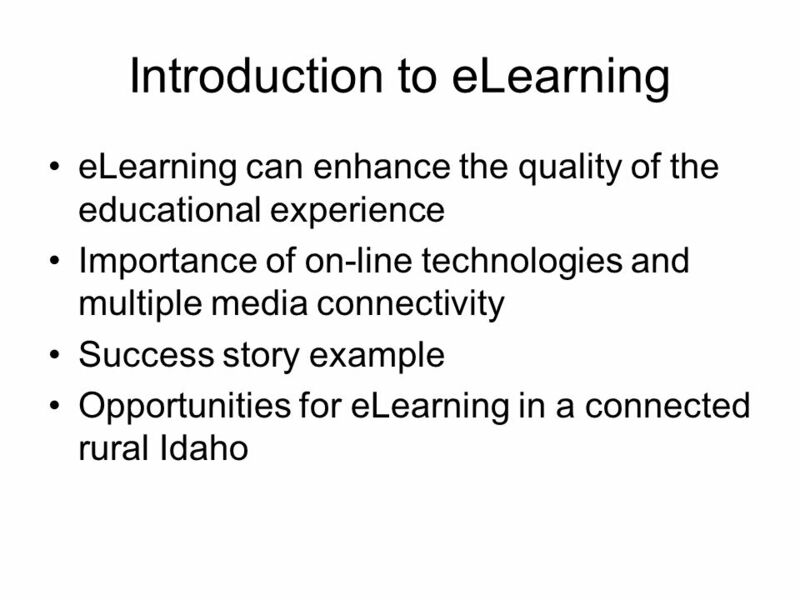 ELearning and Matilda. Alexia Bumbaris Historian and PhD- student at the University of Vienna Focus on Gender History Former study assistant eLearning. ©2007 Kasamaporn Maneekao and Sonthida Keyuravong E-Learning in English Language Teaching and Learning Kasamaporn Maneekao Sonthida Keyuravong King Mongkut’s. Camelle Simmons SHARING IS CARING: ESOL TEACHING IN 1 ST PERSON https://www.surveymonkey.com/s/DF9D9Q2.